I am primarily a wilderness landscape photographer. I enjoy backpacking for miles and miles into the wilderness, oftentimes where no trails exist and I have to find my own way with just my map, compass, and instincts. Whenever I plan a trip, I think about the vistas I might encounter, and of course the potential for photographing these vistas. If you’ve taken a peek at my photo gallery yet, you’ll see that I really like the grand scenics. I savor those huge expansive views and unique perspectives on rugged peaks, and I try to capture those scenes on film. I spend hours pouring over topo maps, thinking about where I want to hike and camp. Topo maps can’t be beat for planning hiking routes, but when it comes to previsualizing potential photo opportunities, Google Earth is an incredible tool. 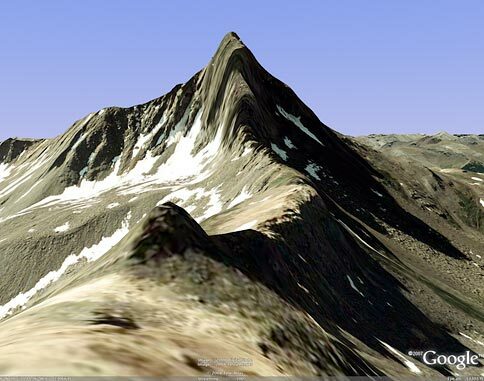 Wetterhorn Peak, a remote 14er in the Uncompahgre Wilderness of Colorado, as seen on Google Earth, and in real life. This is one of those unique views that I had seen while I was flying around Wetterhorn in Google Earth, and thought it was a great perspective. So I went there during a two-night backpacking trip – hiked to the location on a high ridgeline, and hung out for several hours keeping an eye on the clouds and waiting for sunset light. Ok, I’m sure some of you may be thinking – isn’t this cheating? Doesn’t this take the fun of exploration and discovery out of it? 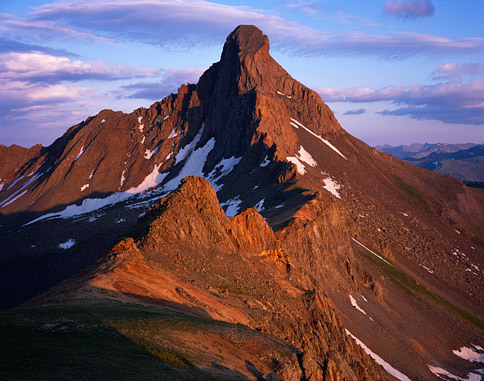 Well, first consider that I am hiking many miles in the mountains to get to these locations, usually without trail – all while carrying 20 pounds of large format camera gear on my back, along with a full load of camping equipment, food, and clothes. On longer trips my pack is horrendously heavy. Oftentimes I am hard-pressed to just make it to these spots, much less wander around an entire mountain basin searching for potential landscape shots. On Google Earth I can “fly” around an entire area checking out the general perspectives until I narrow it down to a certain area that I know offers my favorite perspective. Then when I’m out there hiking, I can boogie up to that area, and concentrate on finding the perfect composition, knowing that I don’t have to search further up or down or sideways. Believe me, on a long backpacking trip when you’re so exhausted you just want to relax at your camp, this tool is an absolute godsend. One ironic twist to what I just said is that in many cases I end up hiking much further than I normally would, just to get to some of these spots that I’ve scoped out from Google Earth. It leads me to bushwhack off trail more often, because the best views are rarely to be found right from the trail. In any case, one main goal of my photography is to find the ultimate mountain views and capture them (hopefully) under amazing light. Since I have to get to these places on my own two feet, tools like Topo maps and Google Earth definitely increase my odds of success. You can download Google Earth for free. Posted in Articles on February 26, 2008 February 9, 2010 by Jack. It’ll change your life in GE. What Scott said! I’m a GE junkie! And I agree about the Space Navigator! So much fun and useful, like a video game for map geeks! Great blog Jack! Scott, I knew you’d like this post! Thanks for the link… looks like a great addition. What about joining a site like Panaramio and adding your awesome photos with GPS data to the collective photography of the web? I read that less that 40% of photographers are doing this now. Your specialized photoscan be archived and shared forever! !